If you’re looking for last-minute inspiration to plan your holiday party, check out this quick article at BizBash. Whether you’re planning a corporate holiday party or a private social soiree, Puff ‘n Stuff Catering can help you pull all of the details together quickly, easily and on budget…and make you look like a pro! “As we enter the thick of the corporate holiday party season, here are some ideas and resources to keep a group entertained, fed, and rewarded. 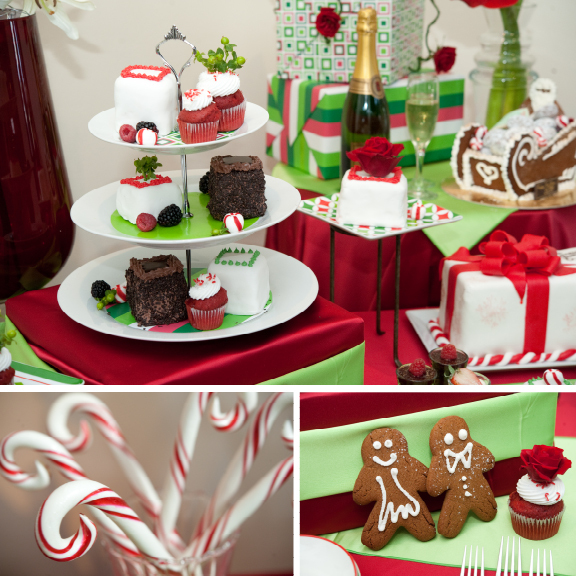 Puff ‘n Stuff Catering recently had the opportunity to design a “sweet” dessert and champagne table for a “Merry Marry” holiday wedding inspiration shoot featuring a peppermint hot chocolate bar, rich red velvet cupcakes, and beautiful DIY flowers from Fifty Flowers. Photos from the shoot are up on the OneWed.com blog, and the post intro is included here. 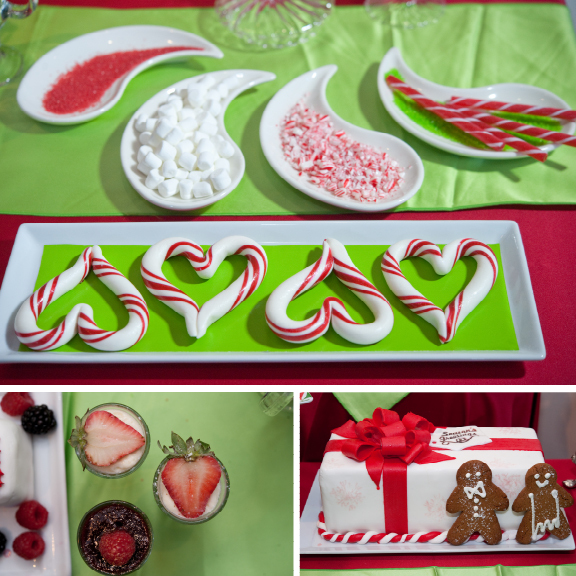 Check out some of the beautiful shots from John Unrue Photography of our assortment of red, green and delicious treats! ‘Tis the season for a sweet I Do! 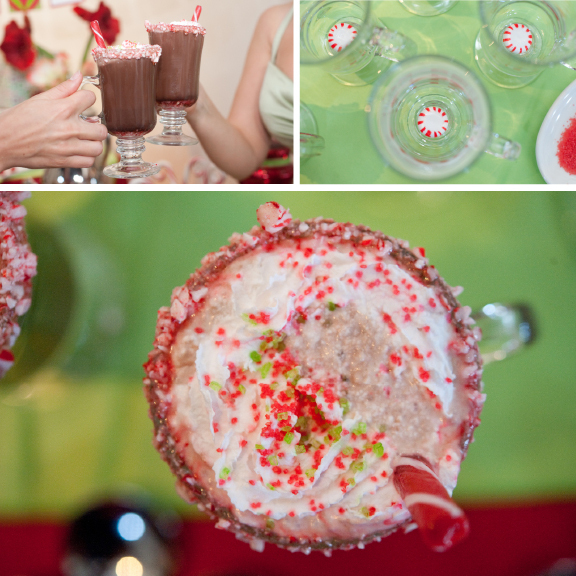 Imagine a holiday wedding in a hometown chapel followed by champagne, wedding cake and peppermint hot chocolate. The scene is infused with red, bright green and geometric patterns creating a whimsical wedding approach to the season. And just about everything is adorned with fresh flowers, including the toasting flutes. 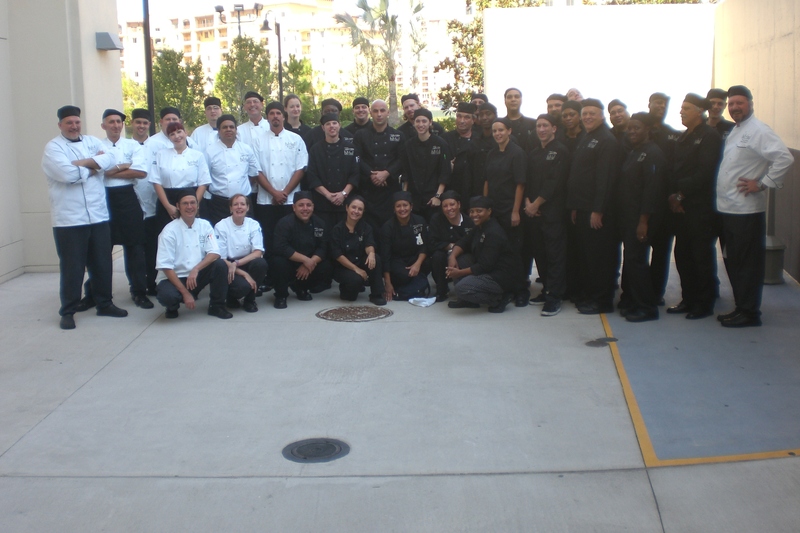 What Does a Special Event Planner do for Puff ‘n Stuff Catering? My name is Sandy George and I am a Special Event Planner with Puff ‘n Stuff Catering. 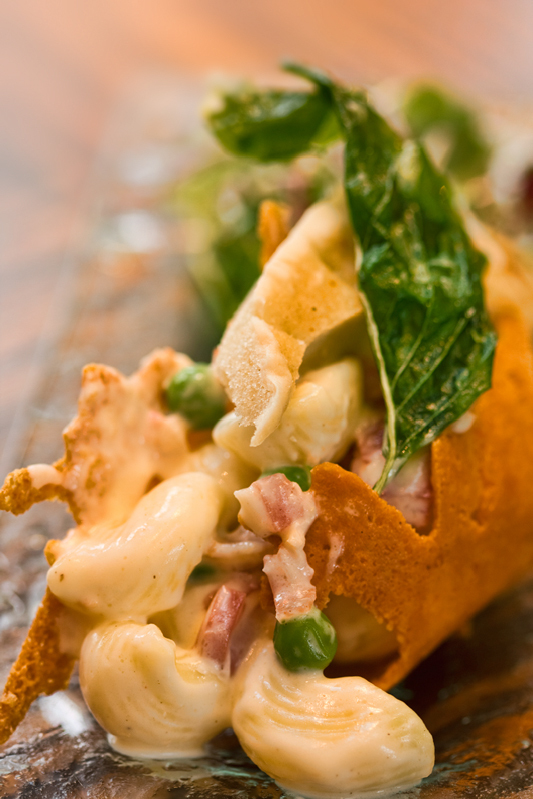 We cater venues off-site, in peoples homes, and individual residences. We cater events at venues varying from: museums, a tent in a park, an airport hangar, any location can be a party place. From social to corporate clients, I handle a lot of weddings for the Ballroom at Church Street Station. Our clients come from different markets–mostly local. We are expanding to to other markets outside of Orlando as well. Special Event Planners work with Puff ‘n Stuff clients from beginning to the end of the event. From helping them book the venue, to their menu details ,and working with their vendors. We want to make your day exactly what you expect! The annual Slow Down at the Brewery event is happening on June 24th. This event allows you to taste different food as well as beer. Different topics are also discussed to educate you on different facts about food. Also upcoming is the annual Freedom Fest in July. This year it will be held on July 2nd and the expected attendees are over 12,000. Make sure you come out and support! From a Barbie-inspired birthday party to a Kentucky Derby celebration, themed parties are back. And they’re more fun than ever! 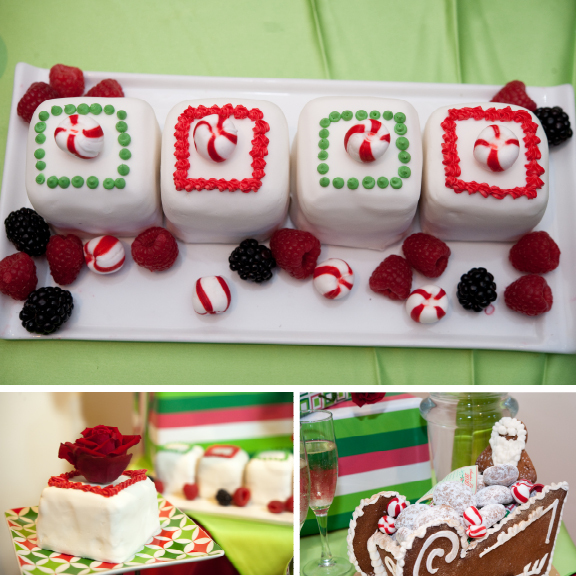 This year, I’ve had the privilege of working on a few themed parties – here are some highlights of my two favorites! Barbie Turns 50 Party. The guest of honor held her 50th birthday in her Orlando home. Barbie also turned 50 this year, so our client decided to go with that theme and host an adult dress-up party. We enhanced her home with hot pink lamour linens and martini-tied cocktail tables. We even covered her sectional sofa with white lamour for a more feminine touch! To further accentuate the theme, our staff (Stacey and Jeriko) had fun playing dress-up for the day. Barbie dolls were incorporated into our station set-ups, and there was even a life-size Barbie box where guests could pose and take pictures. Kentucky Derby Party. 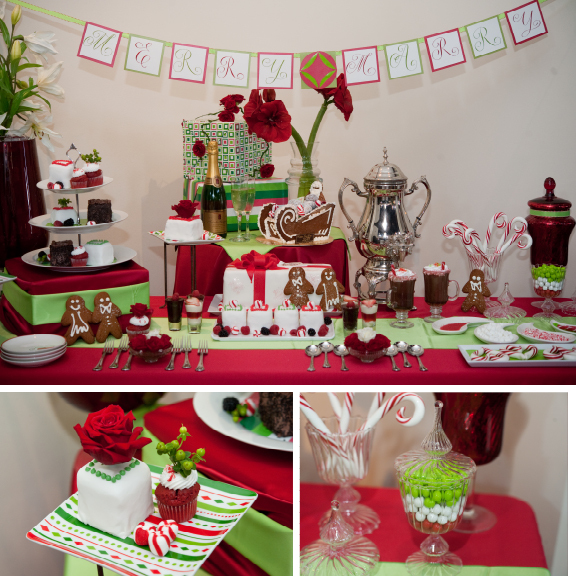 In celebration of the 2009 Kentucky Derby, our client wanted to host a party. This southern theme was clear from the start. We paired fried green tomatoes with English tea sandwiches and sweet corn and ricotta fritters. The host even provided traditional silver mint julep cups for us to use for the traditional derby drink. Guests cheered on their favorite horse around the client’s big screen while they enjoyed the menu themed for the occasion. During my first meeting with Maxine and Lamar, Maxine came to me with several beautiful and unique color pallates. Swatches and color chips inhand, how was she ever going to choose! I could tell she had a flair for style and wanted to design a beautiful and unique look. We looked through some of her favorite color options, but decided to focus on the menu during our first meeting, knowing that her color scheme would fall into place. When Maxine and Lamar came in for their tasting the details had begun to fall into place. They had decided on a color pallatte of light blue and silver with “pops” of yellow. Quite fitting for an Easter weekend wedding! With the help of wedding planner Tamuel Coward from Remembering When Event Planning, we used Wedgewood Bichon on the seating tables and Silver Bichon for the head square table of 6. Silver chivaris were the chair of choice and she accented the tables with silver chargers and butter yellow napkins. We also incorporated the butter yellow “pop” on the buffet and display tables as well. One of my favorite aspects of the wedding was their Popcorn Bar. Maxine and Lamar chose popcorn flavors that included white cheddar, buffalo wing, chocolate, caramel and butter. 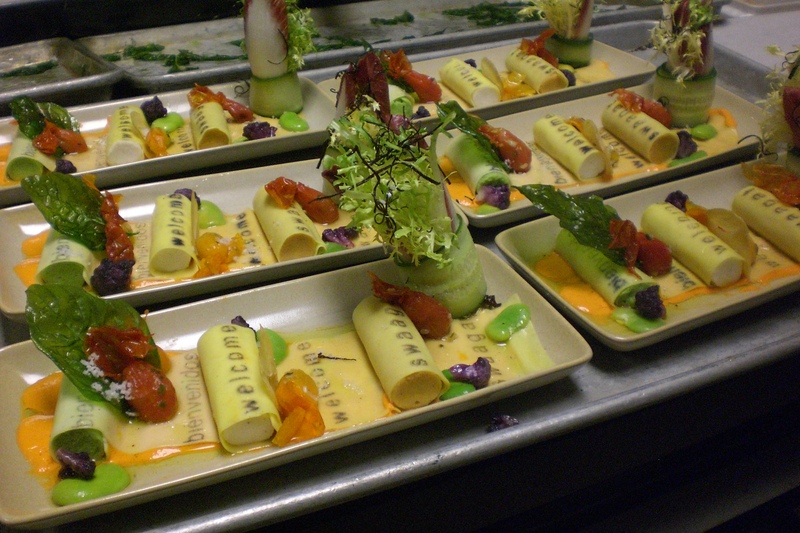 A creative touch and special treat for their guests and another “pop” of yellow. While pops of yellow were present in the reception decor, they were also noticeable in her attire. Maxine carried a gorgeous yellow bouquet created by Vicki at Peddles that included orchids. She really let her style shine with her choice of yellow shoes. A stylish and sassy touch. The yellow bouquets were the perfect compliment to the bridesmaid’s light blue dresses and the groomsmen’s traditional seersucker suits. Color “pops” are often the final accent that tie a wedding together. They underline the couple’s sense of style and personality, and more importantly create a beautiful atmosphere for their guests. Cooking by definition is what happens when you apply a temperature change and/or chemical change to an edible object (ingredient). The relationships between ingredients and a controlled environment, as well as exposure to other ingredients, are the building blocks to knowledge. Its the understanding of these relationships that inspire innovation. From the simplest forms of manipulation such as butchering a piece of meat to accent its appeal in flavor, texture, and visual attributes; to raising the experience of elements through altering their structure on a molecular level through all forms of technique. This library of knowledge and experience of these relationships are what forms and shapes style. Where creativity meets methodology innovation is born, but it’s not enough to achieve excellence. Those words shook my core at a time in my life where I was focused entirely on training and perfecting my technique and pallet. It was then I was reminded of the primal necessity of what created the existence of my field, and defined what I do as a chef. At the core food is a cornerstone of survival and demands the reverence of sustenance before all else. It is that experience in which we all must participate in order to survive that my goal in life is to bring pleasure to. At the end of the day it’s these ideals that drive me to achieve excellence. But its not just about getting from A to B and doing it well, a big part of it all is enjoying the journey. Whether you are planning a wedding, baby shower, private dinner for two or a large corporate event there are a lot of ways to not only make your guests happy but also the environment. Many people are focusing on making their events eco-friendly. Saving our planet just gives us one more reason to celebrate. So in honor of earth day, here are some great ideas for making your next event more green. Invitations. When choosing your invitation, consider using plantable seeded paper, recycled paper, or even bamboo paper – and to go completely natural have them printed with soy or vegetable oil-based inks. A less formal alternative is to send an email invitation. Sites like Evite.com have endless options to choose from with every theme imaginable and the best part there is no paper, no waste and no fuel emissions. Décor. There is nothing like first impressions. Using natural, earthly elements will enhance the ambiance of your party. Try decorating with old colored glass bottles in shades of green, blue and browns to bring the colors of nature right into your centerpieces. These one-of-a-kind vases used in different shapes and sizes add dimension to your tables. You can also use potted plants and flowers and invite your guest to take them home as a cheerful reminder of your special event that they can cherish for years to come. Fresh fruit also gives lots color and texture to a normally plain centerpiece. Use fresh oranges, limes, lemons or kiwis in a crystal vase with twigs to add color. Place cherry tomatoes and blueberries around a white candle in a hurricane to set the mood for a Fourth of July celebration. Allow your imagination to go & grow wild. Menu. Ask your caterer to buy organic and use local farms, when possible. When Puff ‘n Stuff Catering needs organic materials we turn to our local farmers for example Adale Farms. Adale Farms helps supply our innovative chefs with micro greens to incorporate flavor and texture as well as added nutrition. We have also teamed with up with places like the Orlando Brewery when we want everything including the Ale to be organic. These days everything from organic fruits, vegetables, poultry and meats can be readily found, so there is no reason not to have a healthy, eco-friendly meal for your guests to munch down on. Serviceware. Lots of companies are making tableware with raw materials such as bamboo, bespoke palm, sugarcane or recycled biodegradable plastic. Puff ‘n Stuff Catering frequently uses bamboo bowls, spoons and other serviceware not only to be more green, but also to enhance the décor. Or for a more formal option, pull out the “Good China.” This is a reusable option and is very environmentally friendly and adds a sense of sophistication to your party.